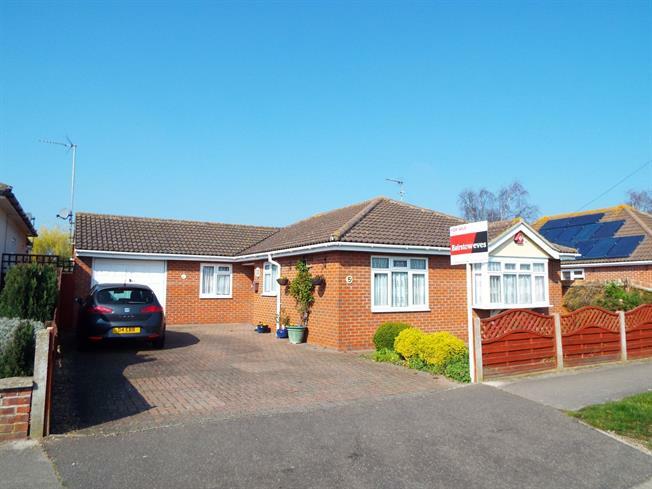 3 Bedroom Detached Bungalow For Sale in Clacton-on-Sea for Offers Over £310,000. FEATURED IN BIG OPEN HOUSE ON SATURDAY 27TH APRIL BETWEEN 12:00-1:00PM CALL TO ARRANGE YOUR VIEWING.Being sold with no onward chain and presented in good decorative order throughout (in our opinion), Bairstow Eves are pleased to offer for sale this three bedroom detached bungalow which is located towards the Northern outskirts of Clacton On Sea. The property is of good size throughout and features lounge/diner, kitchen, utility room, conservatory, en-suite to master bedroom, wet room, garage, driveway and enclosed rear garden. The property is within walking distance to local shops and amenities at Bockings Elm and an internal viewing is highly recommended. UPVC sliding double glazed door. Double aspect double glazed uPVC windows facing the front and rear. Radiator, carpeted flooring. Double glazed uPVC window facing the rear overlooking the garden. Radiator, tiled flooring, tiled splashbacks, spotlights. Fitted units, stainless steel sink and with mixer tap with drainer, integrated oven, integrated hob. UPVC side double glazed door, opening onto the garden. Tiled flooring, tiled splashbacks. Single sink and with mixer tap with drainer, space for washing machine. UPVC patio double glazed door, opening onto the garden. Double aspect double glazed uPVC windows facing the rear and side. Radiator, tiled flooring. Double glazed uPVC window with obscure glass facing the side. Radiator, tiled flooring, tiled walls, spotlights. Low level WC, walk-in shower, top-mounted sink. Double glazed uPVC window with obscure glass facing the side. Heated towel rail, tiled walls, spotlights. Low level WC, wet room, pedestal sink.